"I'd like to rip a Disney DVD that I recently purchased so that I can view it on my iPad. But when HandBrake starts scanning it, it crashes. I've tried it multiple times and I'm not having any luck. Is there a trick to it?" Why Handbrake 1.0.0 Cannot Rip (Disney) DVD with 99 Titles? In fact, DVD creators nowadays develop new copy protection measures out of anti-piracy purpose. As a result, new DVD, especially Disney DVD, usually contains loads of titles, as many as 99, which is responsible for Handbrake 1.0.0 stuck scanning error in DVD main title choosing. Fortunately, there are always solutions out there that help you fix Handbrake error in ripping (Disney) DVD with 99 Titles. Read on for details. Disney DVD discs list multiple instances of a main feature title, all with different lengths. But only one of them is the real thing. HandBrake does its best to guess the correct one, but it often fails, leaving you with the kind of out-of-whack movie you've described. So, the trick to avoid Handbrake failing to rip 99 title DVD is discovering the real title from the 99 titles. Generally, it's advised to choose title with the longest run time while ripping copy new movies on DVD with Handbrake. But cases are those title tracks are almost equal overall run times. Don't worry, here is the solution with the help of a DVD player or VLC Player. Once you keep this title number in mind, you can use Handbrake to rip DVD easily. Install and launch VLC, click File -> Open Disc in the main menu. Once a confirmation dialog showing the disc type VLC found appears, select the movie you want to rip, click Playback -> Title. The title in the list with the checkmark in front of it is the active title you're looking for. To be honest, this is a long way for Handbrake to rip protected DVDs, Disney DVDs, Marvel DVDs or Sony DVDs. 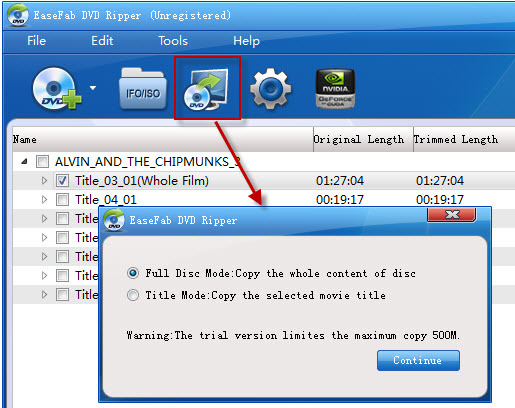 If you still fail to resolve the Handbrake error in ripping copy protection DVDs, you'd better turn to a professional DVD decrypter yet ripper like EaseFab DVD Ripper (available for Windows and Mac users) for better results. As a all-in-one DVD ripper program, this Handbrake alternative incorporates DVD decrypter, DVD copy and converter software into one. It's able to feat any copy protection schemes such as CSS, Sony ARccOS, Disney new copy protection, etc, copy and rip DVD to MP4, MOV, MPEG, FLV, WMV, AVI, MVK, etc and convert DVD to iPhone, iPad and Android within a few clicks. 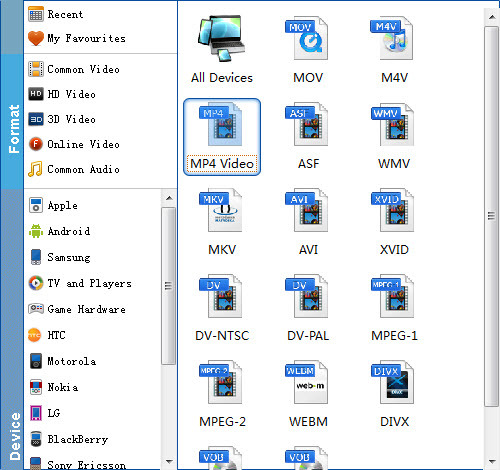 Below is the simple tutorial to use alternative to Handbrake to rip DVD with 99 titles. Step 1: Insert a DVD into your DVD drive, and click the Load DVD button. The program will add the DVD to the program and list all the titles. Note: A DVD may contain many titles more than the main movie, such as the trailers or commercials. By default, EaseFab DVD Ripper choose the longest title which is usually contains the main movie. And this helps ripping without converting unnecessary titles. Step 2: Click Profile (located below where your DVD's files are displayed) and select the format you want from the drop-down list. Just below Profile is Output, here you can browse your computer for a better destination folder for DVD Ripper to save your converted movies. As you see, all regular video and audio formats like MP4, MOV, MKV, WMV, AVI, FLV, MP3, WMA, WAV, M4A, etc. are provided. Step 3: Simply click the Convert button to let the software start ripping the 99-title Disney DVD.